I started my career as a park ranger before I began teaching at Wayne Community College. I would have never imagined early in my career in natural resource management that I would rise to a leadership position in higher education. I had the opportunity to teach at Wayne and soon realized how much I appreciated being a part of an institution that provided education to all. As an instructor, I became a student in the program at the College of Education at NC State. What led me to want to take classes was an interest in the operations and functions of the College. While an instructor, I had been given the opportunity to participate on many different committees and projects on campus. These work experiences led to a desire to know how all of the different processes came together and how they were used to lead the institution. What I found as I began to take course work in the doctoral program, was how relevant it was to what I observed regularly on campus. The contextual presentation of material gave me perspectives that I had never thought of or been exposed to in relation to leadership and administration in higher education. One by one, the classes provided me with more relevant knowledge, confidence, and the skills to use to move forward into other leadership roles. The coursework was like a hook — it made me realize I was in the right place. I have occasionally looked back into old textbooks and notes to review conceptualization, logical planning, and the execution of projects and initiatives. Many of the practical skills that I learned in the program are still very useful in the functions in my current position as President. Perhaps some of the most important skills that I learned from the professors, classmates, instructional materials and dissertation work related to working with other people and how important it is to grasp and master this as a leader. The information that “sticks” with me the most are many of the organizational theories and practices as well as the importance of surrounding yourself with skilled, well-trained, capable individuals who assist with making shared decisions. It is so crucial to gather as much relevant information from those who are knowledgeable, and analyze the information which enables you, as the leader, to make the most informed decisions you can. As the leader of an institution you must often make critical decisions. The more information that you have, the better the decision! If I could make any suggestion to an individual considering enrolling in this program at the University, I would first congratulate them for choosing North Carolina State University. I would then suggest that they commit to completion. The work and time that it takes in a graduate program takes a serious commitment, but what I found was that it was well worth the effort and a worthy goal to seek and complete. Dr. Brewer rose from the ranks of faculty to serve as the executive assistant to President Martin Lancaster and the Executive Director of the State Board of Community Colleges. 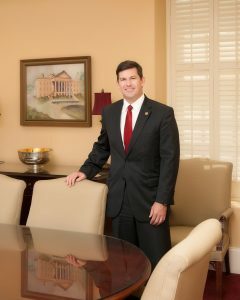 In 2005 he moved to Mitchell Community College where he served as Vice President of Instruction, and then Executive Vice President Chief Academic Officer before taking on the Presidency in 2012.